Pickers in the style of players like Chet Atkins and Merle Travis use the left hand thumb to help play extended bass lines while keeping a top line going. This is a simple example of such technique using the left hand thumb to play a G bass note followed by a G# at the start of the tune "Stormy Weather". I have put the chord sequence above the tab for reference but note that I'm not playing any chord shapes as such until the D7. To start put your 1st finger on the top 3 strings at the third fret and your L/H thumb on the 6th string at the third fret - then play the first two melody notes ( keep that second note ringing as you play the third note ) bring in the bass G note as a pinch with the third melody note. 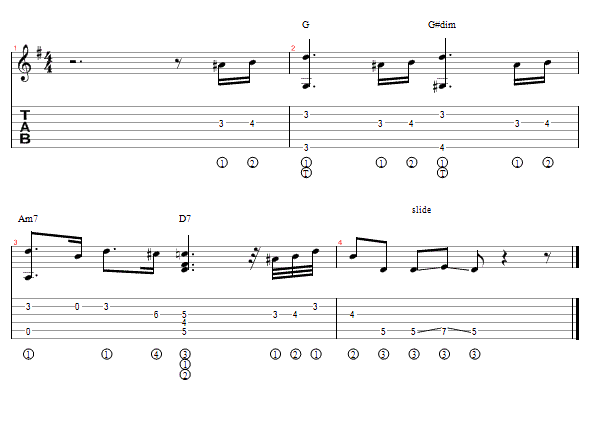 Then repeat but with your thumb moving up to the 4th fret ( G# ). Repeat again with the open A getting the bass note then a different bit of melody ending on a D7 chord. There are probably other ways to play this but, once you've mastered this thumb technique, I'm sure there's no way that's easier.